Swipe and Tilt Your Smartphone to Keep People from Dying Stupidly! Albert Einstein has told us that only two things are infinite: the universe and human stupidity. Everyone has their bouts of the latter. More often than not, it just results in laughter at the stupid person’s expense. Other times, it results in death. The Dumb Ways to Die game was made after the success of the above viral video. What's your favorite "dumb way to die"? You’ll be privy to both in Dumb Ways to Die, a darkly humorous game of speed based off the hilarious internet sensation from Metro Trains Melbourne. Dumb people are everywhere and they’re all about to die in equally dumb ways. It’s up to you to keep that from happening using the capabilities of your iOS device. If you win, you will be a hero. If you lose, then some people will be getting their well-earned Darwin Awards. Metro only scratched the surface when they listed the many gruesomely funny ways in which you could kill yourself. You could take off your helmet in outer space, hide in a clothes dryer, or sell both your kidneys on the Internet. Those same fools who killed themselves for your amusement in the original video are about to do so again. Only you, your touchscreen and your accelerometer can save them! Tilt your device to maintain the balance of the superglue-eater and keep him from falling over. Avoid the room with the psycho killer. Get people off the railroad tracks before the train arrives. Remove the fork from the toaster carefully. Chase away piranhas with a flick of your finger before they bite the idiot where the sun doesn’t shine. Act Fast! Nobody said saving the lives of a bunch of imbeciles would be easy. From the very beginning, you will only be afforded a few precious seconds before death rears its ugly but laughable head. Things will only escalate from there, proving once and for all that human stupidity truly knows no bounds! Levels and scenarios appear at random. Be ready for anything. Increase your total score with every dumb death you prevent. The levels get harder the further on you go. Stay alert! The game picks up speed at a steady pace. Fail three times and it’s game over for you. Virtue may be its own reward, but you can win a whole lot more than that if you can prove your prowess in Dumb Ways to Die. Unlock the whole cast of characters to make for a more lively and soon-to-be deathly title screen. Acquire your own copy of the original “Dumb Ways to Die” video and watch it whenever you like. Post your scores to the online leaderboards and show everyone just how great of a lifesaver you really are. If you have a macabre sense of humor alongside an iPad, an iPhone or an iPod Touch, then the smart thing would be to download and play Dumb Ways to Die right away. It’ll test your reflexes, bust your guts, and put that catchy song back into your head. The game is easy to pick up, simple to learn, hard to put down, and completely free. Play it at home, play it during your coffee break, or play it while you’re riding on the train. Just don’t play it while you’re sitting on the train tracks themselves. As Metro will tell you, that’s one of the dumbest ways to die. Public service announcements don't usually get video game adaptations, but Metro Trains of Melbourne, Australia proved that anything is possible. When their gruesomely hilarious web cartoon called Dumb Ways to Die went viral, perhaps it was only inevitable that someone would want to add an interactive element to the whole shebang. Whatever the reasons were, the most important thing to know about the Dumb Ways to Die game is that it's pretty enjoyable for what it is. While by no means deep or anywhere close to being a classic, it nevertheless carries a charm not at all unlike Metro's PSA. More than that, there's no arguing with the nonexistent price tag it has going for it. If you've seen the original animation, then everything about the game should look immediately familiar. It has the same cartoony aesthetic, those same oddly-shaped characters, and the same deadly situations. You'll see that same blue idiot run towards you while his hair's on fire, that red fool who's using his "private parts" as piranha bait, and even that eye-biting rattlesnake. It's admittedly a bit of a shame that there's nothing really original to find here, but the visuals are every bit as fun, quirky and charming as they were in the PSA. Furthermore, it continues to be just as amusing to watch all these people die in humorously gory ways. Dumb Ways to Die revels in its violence, which is as delightfully over-the-top as its simple visuals will allow without being disturbing. Anyone with a black sense of humor will find plenty to enjoy on this front. On the other hand, the sound isn't quite as impressive, but it still gets the job done. The soundtrack consists largely of remixes of the original song, which is still as catchy as ever. The menu includes a gloriously retro 8-bit rendition, while normal gameplay features a more low-key beat that should get you in the mood without breaking your concentration. Neither is much to write home about, but they're fitting and inoffensive. Dumb Ways to Die is not a complicated game by any stretch of the imagination. It consists largely of a series of small and very simple minigames that all have one goal in mind: keep the dummies from killing themselves. Many of those familiar scenarios from the original PSA are back, but this game lets you change the way they end. The variety of minigames you'll complete is pretty nice, and they're all carried out with a creative assortment of responsive controls. For the guy who set his head on fire, you have to tap the screen quickly to put it out before he burns to a crisp. For the moron who's trying to extract bread from his toaster with a metal fork, you have to carefully remove the item without touching the sides. For the simpleton who threw up after he ate a "two-week old unrefrigerated pie," you have to wipe up all the puke on your screen. In order to save the one fool who's being attacked by hornets, you have to squish those bugs with your finger. Meanwhile, the person who's teaching himself how to fly requires you to keep his plane airborne by blowing air into the device. The list goes on. The challenge is that you have to complete these tasks in a timely manner. If you fail to do so, then the poor sucker will lose his life while you lose one of yours. You only have three lives to spare before your game ends, so you have to constantly be in motion. Furthermore, the games also grow more challenging over time; more things need to be removed from the screen, and you're given progressively fewer seconds to do so. While Dumb Ways to Die is simple, it's very fast-paced and it ratchets up the difficulty something fierce. Unfortunately, the challenge gets a little too hectic after a while. While some games can be pretty manageable at higher levels, others just seem downright impossible. The aforementioned airplane game can be real finicky. While there is a lazy option to disable it, that doesn't exist for a lot of the other ones. The game where you have to clean up all the vomit on screen eventually just gives you too little time to work with, as does the toaster minigame. Practice may make perfect, but when you find yourself failing on the same couple of scenarios, it starts to make the whole thing feel more like a luck-based game. Remember how the chorus of the original PSA's song said there were "so many dumb ways to die?" Sadly, the game doesn't quite tap into that potential. As said before, it only includes scenarios from the cartoon, and it doesn't even cover all of them. There's only about a dozen minigames to play. That may sound like a decent amount, but it really isn't. After playing Dumb Ways to Die for less than an hour, chances are you'll see all it has to offer. Even the game's charm and humor can wear itself thin after a while. 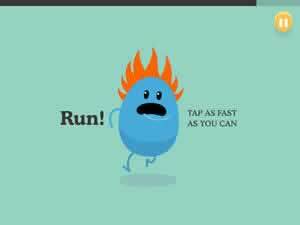 Likewise, Dumb Ways to Die just doesn't have much else to keep you occupied. You can keep on playing to beat your personal high score and even submit it online, but that's not likely to keep your attention forever. 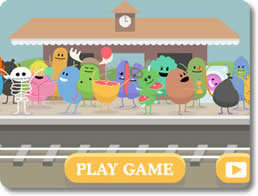 You can try unlocking all the characters from the original video and watch them do their little dance at a train platform, but that isn't much to gloat over. You can even unlock Metro's original cartoon and watch it on your preferred mobile device. However, anyone who wants to see it can do so just as easily by going to YouTube or the original site. While Dumb Ways to Die is indeed repetitive and does not have a whole lot to offer, it's very hard to hate or stay mad at for long. It's charming, it's darkly funny, and it can be engaging for short bursts of time. In many ways, it can be more enjoyable to lose than to win. At the very least, it should at least entertain you for an afternoon or while you're commuting. The game is completely free to download and play, it makes absolutely no attempts to nickel-and-dime you, and you'll pretty much get everything it promises. On that note, it's definitely worth a look for the morbidly curious.